A slow surf day in OB. Photo by Jim Grant taken on Nov. 3, 2010. A large group of OB homeless folks held what they called a “People’s Court” on Thursday, and dished out sentences to several of their compatriots for recent transgressions within their crowd. One man was found guilty of his peers of theft, the stealing of a skateboard. His sentence: return of the skateboard or its replacement and 2 packs of smokes. The Federal Aviation has just announced that the board is making a big change in San Diego airplane take-off routes. Beginning May Day, the routes will no longer be over Ocean Beach and Point Loma but are to be routed over the community of La Jolla and over the City of Coronado. When locals heard the news, there was a great outpouring of OBceans along Newport and Voltaire, and fireworks here heard being set off in the alleys. A last “OB Pause” party has been set for April 30th – which is when the last airplane is anticipated, and therefore, the ‘last’ OB Pause. The head of the City of San Diego tree maintenance department – the crews that maintains city trees in the public right-of-way – has determined that the Torrey Pines on Saratoga Avenue are not in danger of falling and injuring anyone on the ground. After numerous studies by biologists and Torrey Pine experts were completed on the 2 endangered trees over on the 4600 block of Saratoga, it has been concluded that there was no danger of the trees falling, but that they were growing at angels other than straight up. These 2 trees are thought to be some of the largest Torrey Pines in North America. Two breweries on Newport Avenue have had to close their doors recently. Apparently, the main commercial street has been so inundated with beer tasters and breweries over the last several years, that the local market has been literally swamped. There just aren’t enough beer drinkers to keep the numerous suds joints in business, local observers say, and the two beer storefronts have closed over the last couple of weeks. The good news is that a bookstore is coming in to one of the empty locations on Newport. Newport has not had a bookstore since the used bookstore on Cable departed, and Parris’ gift, card and book shop closed. It has puzzled locals for years that with all of OB’s intellectuals and progressives, there hasn’t been a real storefront on Newport that sells actual current books, new or used. It is also heavily rumored that a recreational marijuana dispensary is about to sign a multiple year lease with a major Newport landowner. A loosely-organized group of homeless have now contracted with the OB Mainstreet Association to clean the streets, sidewalks – and even storefront windows of the merchants in the downtown OB village area. “This is a giant step for OB,” Denny Knox, executive director of the OBMA, stated on Monday, “we have finally come to recognize each other and that we share a common ground worth maintaining.” Equipment will be supplied by the merchants’ group and the labor power will be supplied by the homeless group. Both sides were mum as to specifics. 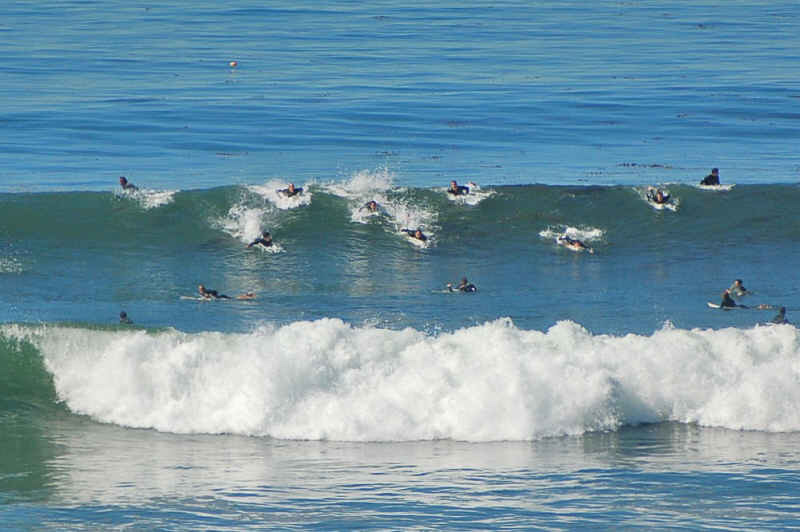 A nationally-known travel blog, WhereZitAt, have downgraded the San Diego community of Ocean Beach in their annual survey of ‘best small villages in large cities’ category. The travel and destination experts cited a number of negative factors that have resulted in the fall in status of OB among bigtime tripsters. Among these are the lack of amenities for high-rollers, such as insufficient night clubs, not enough high-priced hotels, marinas, and yacht docks, as well as too many homeless, too many surfers crowding out their families in the water, too many hippies giving bad vibes. There were upwards of nearly 500 OBceans who voted in the early March annual election of the OB Planning Board. And all those voters elected a slate made up of local environmentalists and slow-growthers. A majority of the Board are now members of a local, grassroots coalition of people who are for a peaceful and harmonious village, who are opposed to gentrification and over-development, who are for more trees and open spaces, more environmental protections of local endangered species, who are against the dangerous trend of wide-spread “condoizations”, and who are for protections against the loss of community from many short-term vacation rentals. Organized by a group of hoteliers, a large crowd of tourists gathered at the OB Pier Sunday morning, with gloves and plastic bags. From there they moved and picked up trash and debris from OB’s beaches and parks for an all-day effort to show appreciation to the community. A well-recognized OB eatery announced that it is dismantling a metal gate and fence that encroached too far into the public space outside their restaurant on Friday. A crew was seen taking bolts out of the concrete and folding up sections of the railing at The Wedge, a sushi joint. After numerous complaints by locals, an investigation by the local group that monitors ADA compliance, and after an informal boycott started, management apparently has been persuaded to bend to public opinion and reasonableness. Citing the overall decline in tourism, 2 surf camp schools are moving to Fiesta Island and setting up kiteflying and waterskiing camps. Lorie Zapf, councilwoman for District 2, has now come out against the police surveillance cameras that are set to be installed along OB’s waterfront. This turnabout in Zapf’s attitude towards the cameras occurred after one of her staffers was arrested for buying a bag of weed under the OB Pier. Conrad Wear from her office declined to name the staff person but did add that San Diego Police are willing to abide by Zapf’s wishes as well as by a recent poll of OBceans that showed a serious split in the community over the cameras. An anonymous donor has surprised the hell out of OB Rag staffers with their donation of $100,000 to the online journal and website. “We can now pay our writers,” editor Frank Gormlie was overheard to say, and “we can open up that dream store front office on Newport,” he added. “We are also planning an OB-centric TV station,” he said. Brilliant! Maybe, in an alternate reality, these events really happened. Thanks. Newer Article: San Diego’s Old Central Library: Public Benefit or Profit Center?